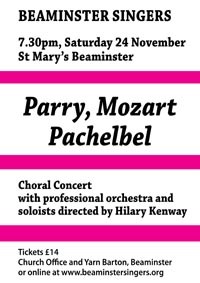 Tickets for our concerts in Beaminster are available from the Church Office and the Yarn Barton Centre in Beaminster or from choir members, or by using the links below. Our recent concerts have been extremely popular and we recommend that tickets are purchased in advance. To buy eTickets using Paypal, select the number of tickets required in the drop down box below and click Buy Now. There is a small charge for this. To pay by cheque, click here to download a postal application form.